We have been working hard in our backyard. We had some landscaping done and now we are working on a play area for the kids. (Before and after photos of that to come.) 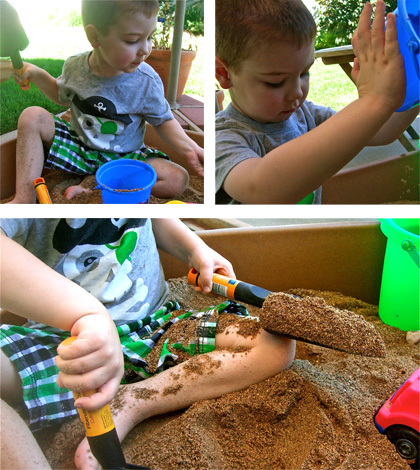 This week, I added our first kid friendly feature to the yard: a new sandbox. Buddy loves, loves playing in the sand. 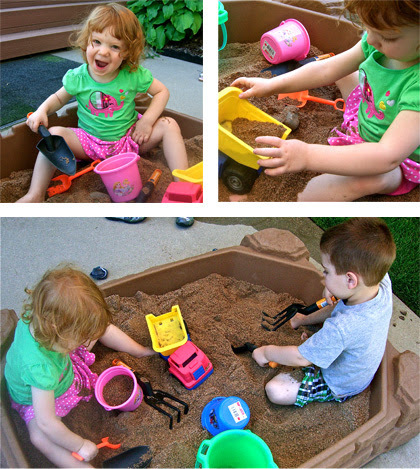 The joy of the sandbox for Jellybean, unfortunately, is in dumping sand on her brother's head. While, I am trying to nip that behavior in the bud, I'm becoming quite good at getting sand out of hair. (It's all about a boar bristle brush, in case you wanted to know.) I'm trying to figure out why toddler activities always seem to devolve this way: Digging in the sand, dump it in the bucket, dig in the sand, dump on your own or someone else's head...etc. I suppose it's only natural.